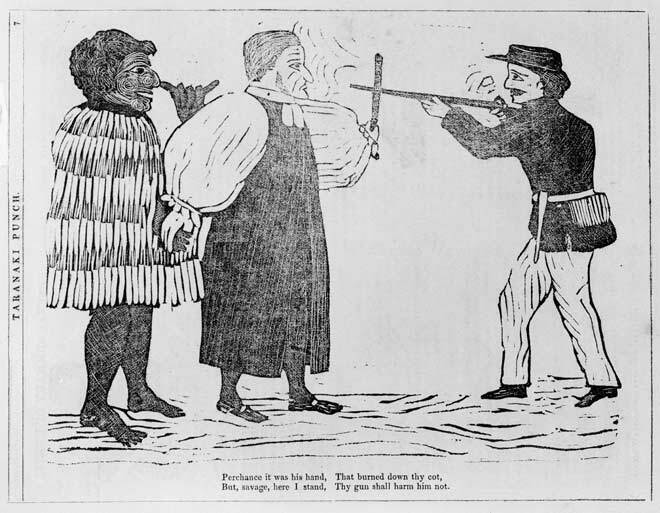 This cartoon from Taranaki Punch in November 1860 depicts Bishop George Selwyn (centre) shielding a defiant Māori arsonist from attack by the British military. In the early colonial period a number of local versions of the British magazine Punch appeared, featuring cartoons reflecting the views of many Pākehā settlers. This cartoon illustrates the common settler opinion that missionaries were interfering busybodies who mistakenly protected violent Māori. It suggests that 'rebel' Māori could only be controlled by force.